Copyright © 2007 Pearson Education, Inc. Publishing as Pearson Addison-Wesley Slide 14- 1. 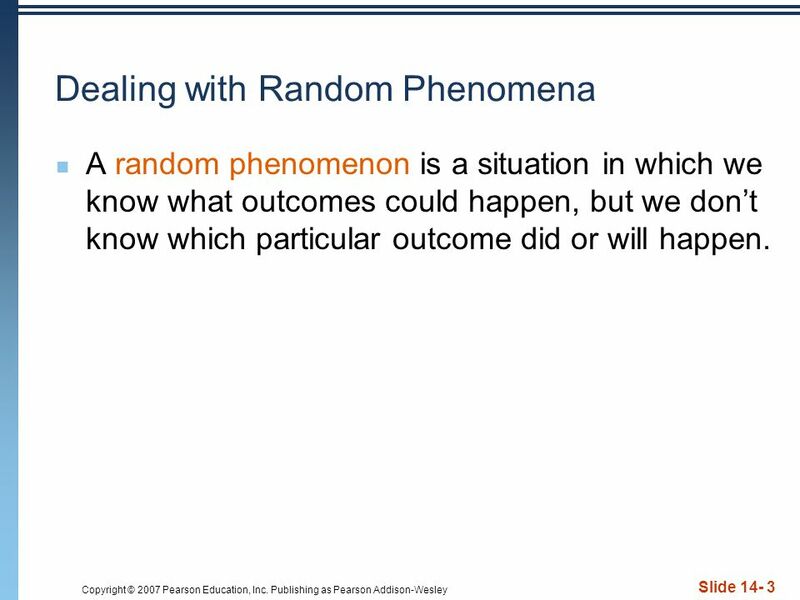 3 Copyright © 2007 Pearson Education, Inc. Publishing as Pearson Addison-Wesley Slide 14- 3 Dealing with Random Phenomena A random phenomenon is a situation in which we know what outcomes could happen, but we dont know which particular outcome did or will happen. 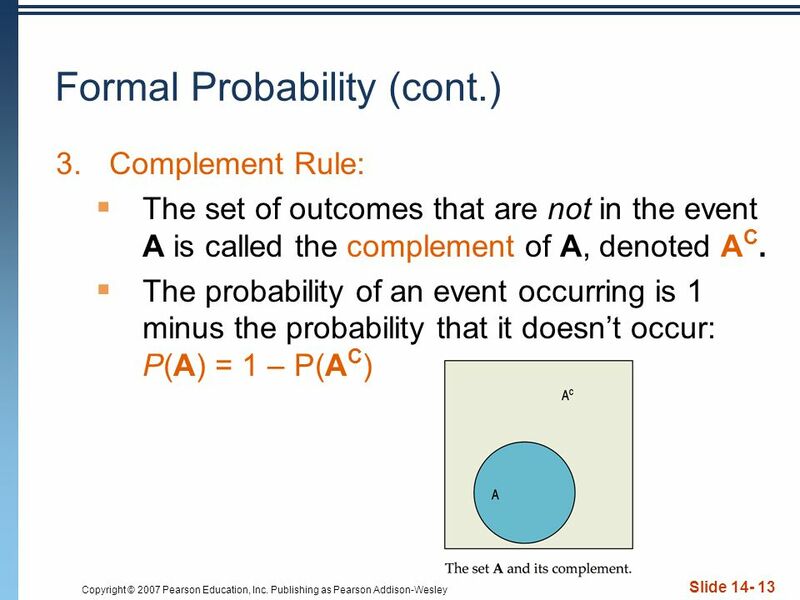 4 Copyright © 2007 Pearson Education, Inc. Publishing as Pearson Addison-Wesley Slide 14- 4 Probability The probability of an event is its long-run relative frequency. While we may not be able to predict a particular individual outcome, we can talk about what will happen in the long run. For any random phenomenon, each attempt, or trial, generates an outcome. Something happens on each trial, and we call whatever happens the outcome. These outcomes are individual possibilities, like the number we see on top when we roll a die. 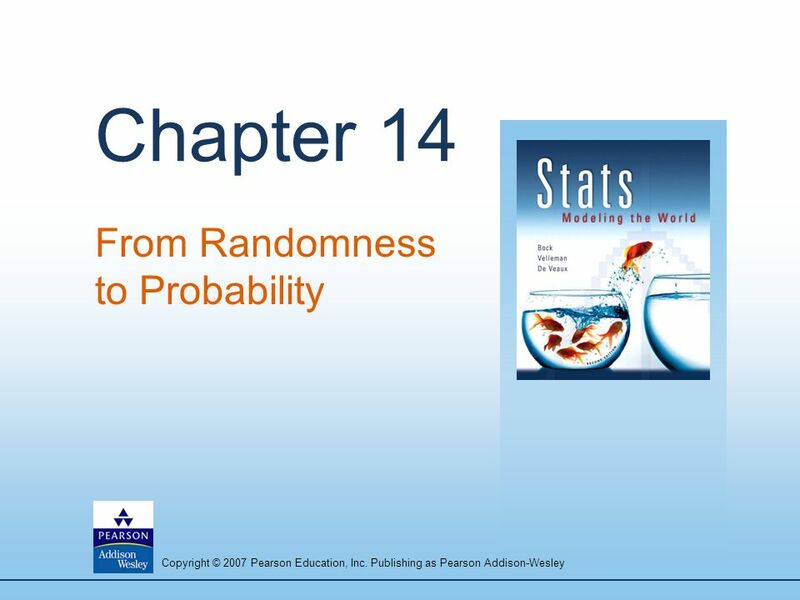 5 Copyright © 2007 Pearson Education, Inc. Publishing as Pearson Addison-Wesley Slide 14- 5 Probability (cont.) Sometimes we are interested in a combination of outcomes (e.g., a die is rolled and comes up even). A combination of outcomes is called an event. 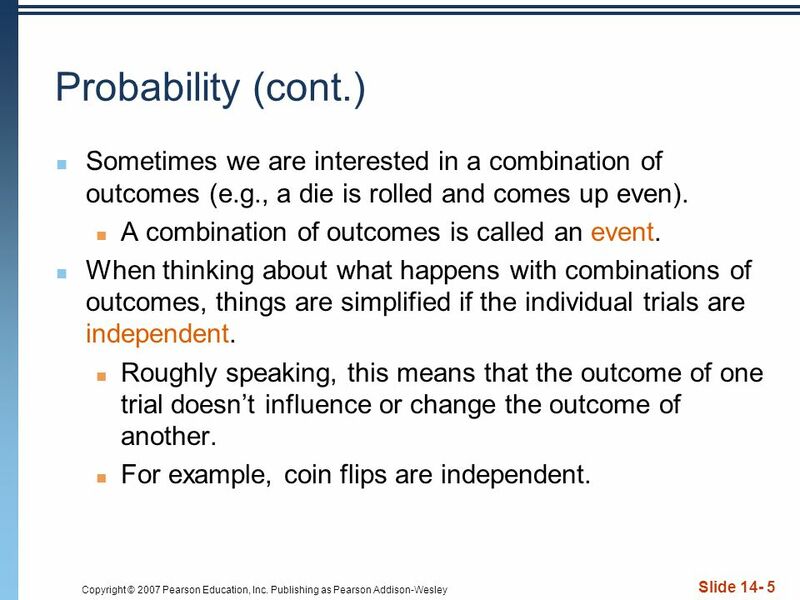 When thinking about what happens with combinations of outcomes, things are simplified if the individual trials are independent. Roughly speaking, this means that the outcome of one trial doesnt influence or change the outcome of another. For example, coin flips are independent. 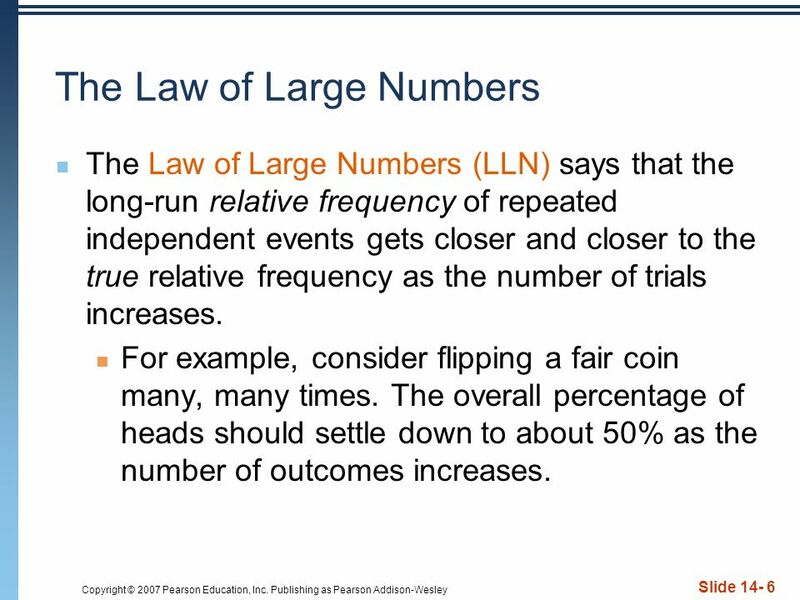 6 Copyright © 2007 Pearson Education, Inc. Publishing as Pearson Addison-Wesley Slide 14- 6 The Law of Large Numbers The Law of Large Numbers (LLN) says that the long-run relative frequency of repeated independent events gets closer and closer to the true relative frequency as the number of trials increases. For example, consider flipping a fair coin many, many times. The overall percentage of heads should settle down to about 50% as the number of outcomes increases. 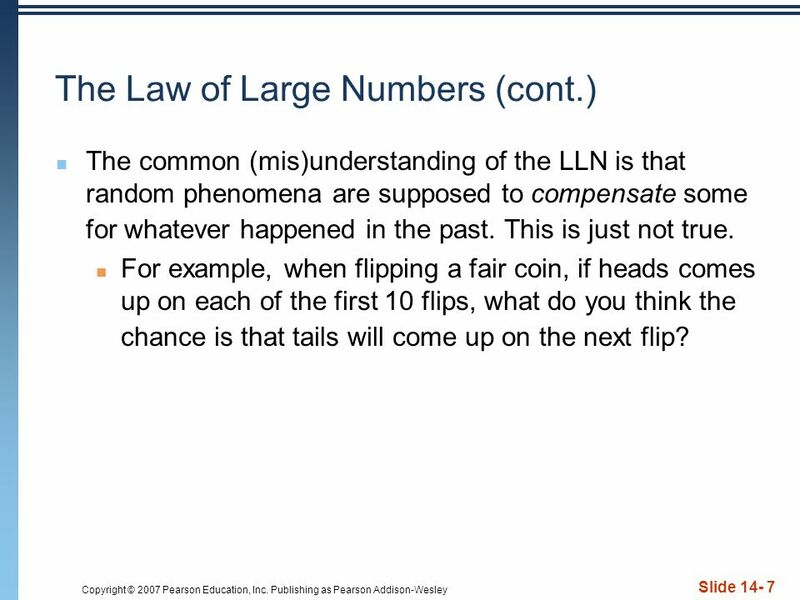 7 Copyright © 2007 Pearson Education, Inc. Publishing as Pearson Addison-Wesley Slide 14- 7 The Law of Large Numbers (cont.) The common (mis)understanding of the LLN is that random phenomena are supposed to compensate some for whatever happened in the past. This is just not true. For example, when flipping a fair coin, if heads comes up on each of the first 10 flips, what do you think the chance is that tails will come up on the next flip? 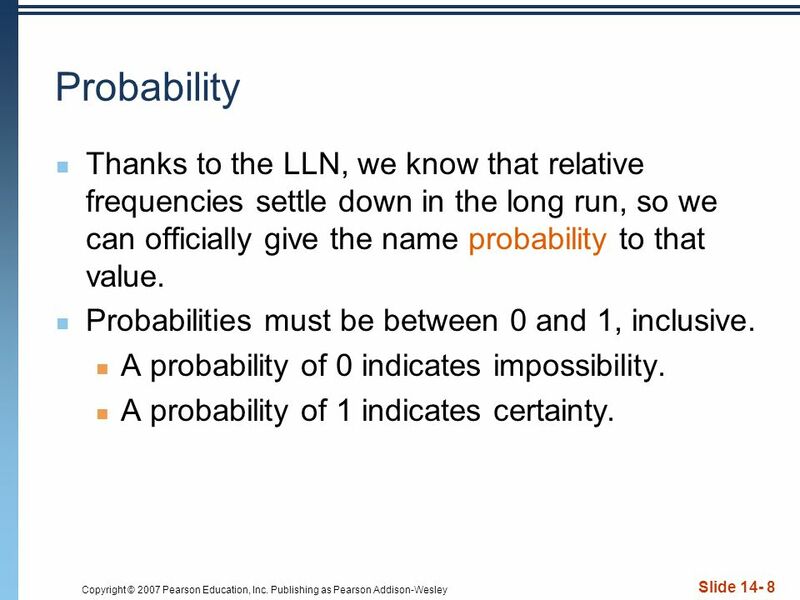 8 Copyright © 2007 Pearson Education, Inc. Publishing as Pearson Addison-Wesley Slide 14- 8 Probability Thanks to the LLN, we know that relative frequencies settle down in the long run, so we can officially give the name probability to that value. Probabilities must be between 0 and 1, inclusive. A probability of 0 indicates impossibility. A probability of 1 indicates certainty. 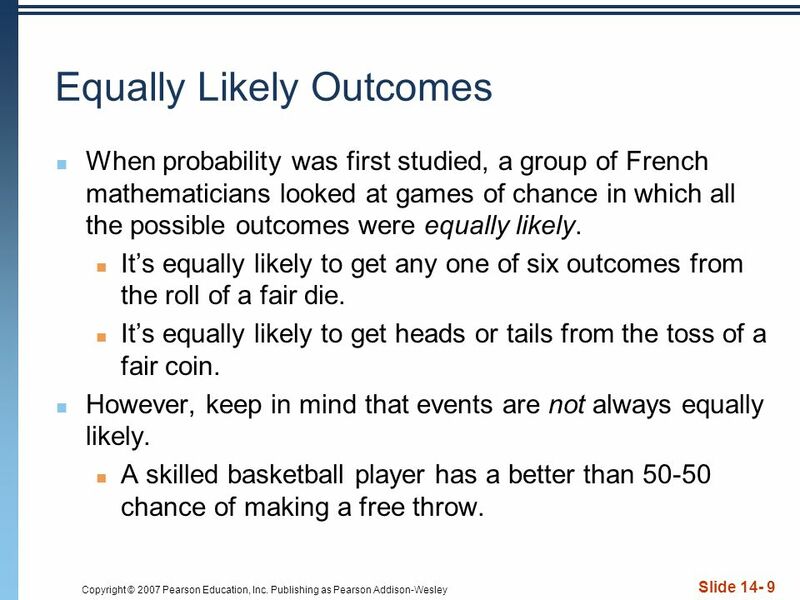 9 Copyright © 2007 Pearson Education, Inc. Publishing as Pearson Addison-Wesley Slide 14- 9 Equally Likely Outcomes When probability was first studied, a group of French mathematicians looked at games of chance in which all the possible outcomes were equally likely. Its equally likely to get any one of six outcomes from the roll of a fair die. Its equally likely to get heads or tails from the toss of a fair coin. 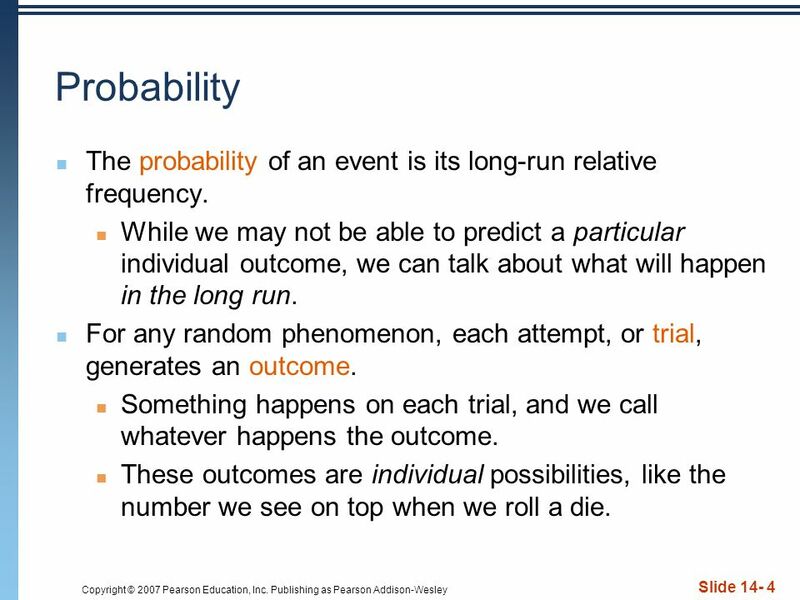 However, keep in mind that events are not always equally likely. A skilled basketball player has a better than 50-50 chance of making a free throw. 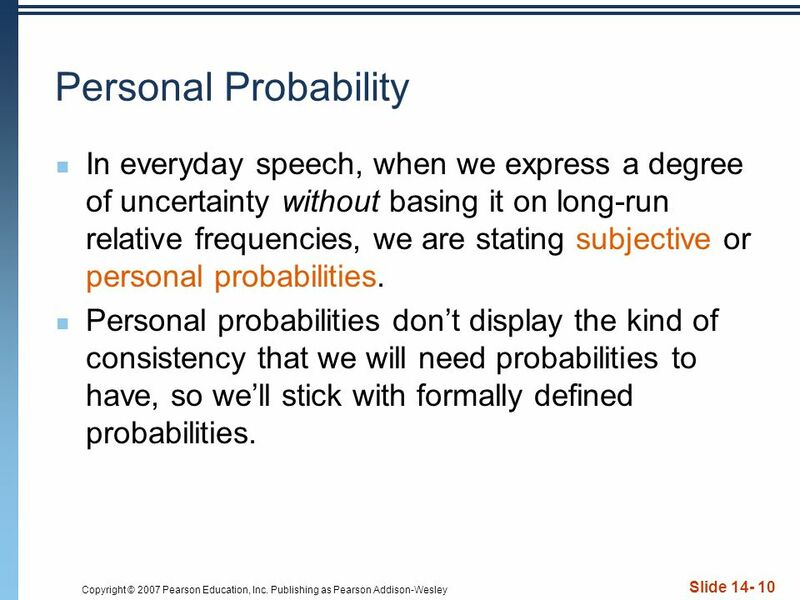 10 Copyright © 2007 Pearson Education, Inc. Publishing as Pearson Addison-Wesley Slide 14- 10 Personal Probability In everyday speech, when we express a degree of uncertainty without basing it on long-run relative frequencies, we are stating subjective or personal probabilities. 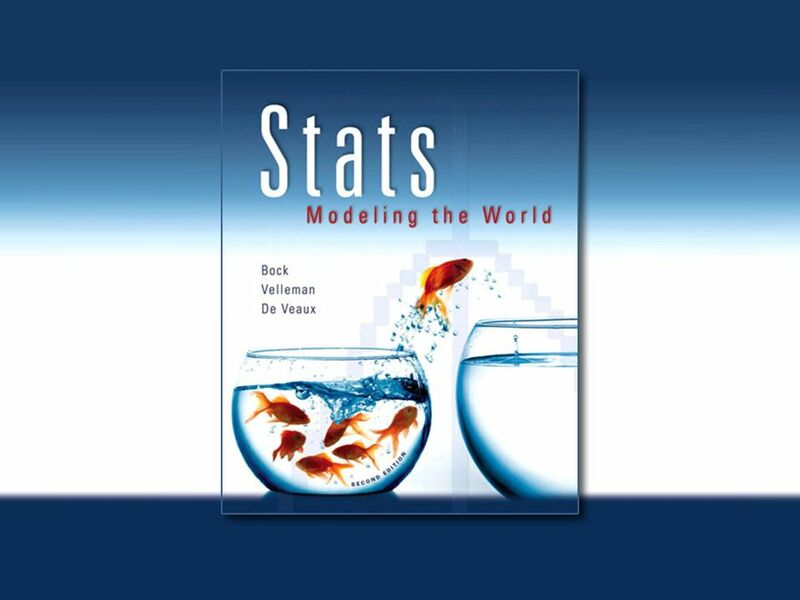 Personal probabilities dont display the kind of consistency that we will need probabilities to have, so well stick with formally defined probabilities. 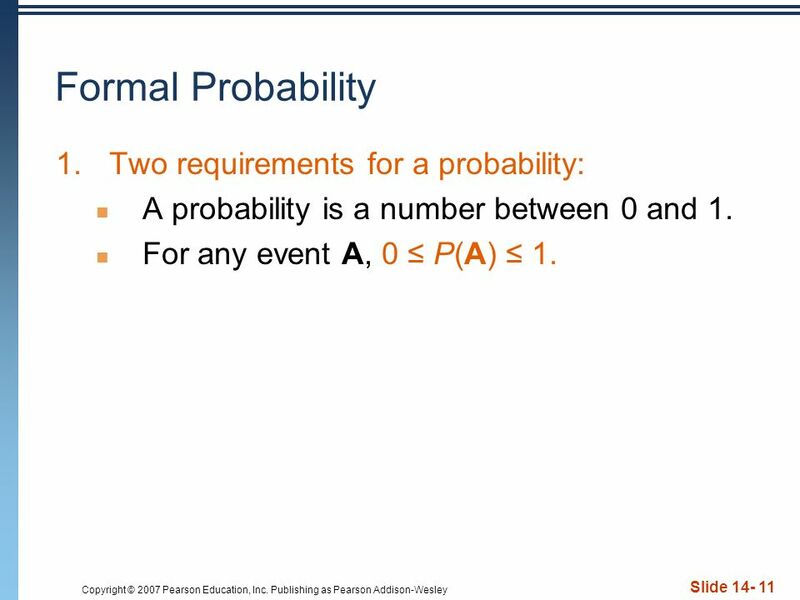 11 Copyright © 2007 Pearson Education, Inc. Publishing as Pearson Addison-Wesley Slide 14- 11 Formal Probability 1.Two requirements for a probability: A probability is a number between 0 and 1. For any event A, 0 P(A) 1. 14 Copyright © 2007 Pearson Education, Inc. Publishing as Pearson Addison-Wesley Slide 14- 14 Formal Probability (cont.) 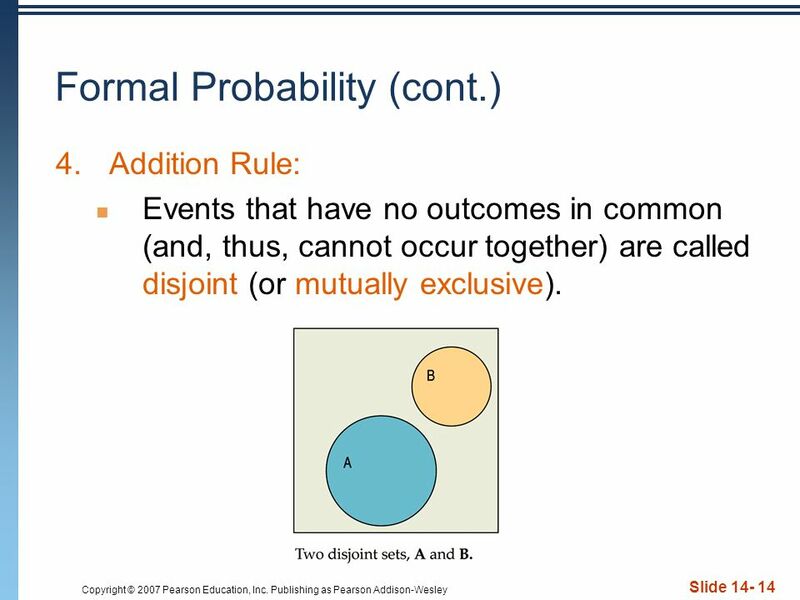 4.Addition Rule: Events that have no outcomes in common (and, thus, cannot occur together) are called disjoint (or mutually exclusive). 15 Copyright © 2007 Pearson Education, Inc. Publishing as Pearson Addison-Wesley Slide 14- 15 Formal Probability (cont.) 4.Addition Rule: For two disjoint events A and B, the probability that one or the other occurs is the sum of the probabilities of the two events. P(A or B) = P(A) + P(B), provided that A and B are disjoint. 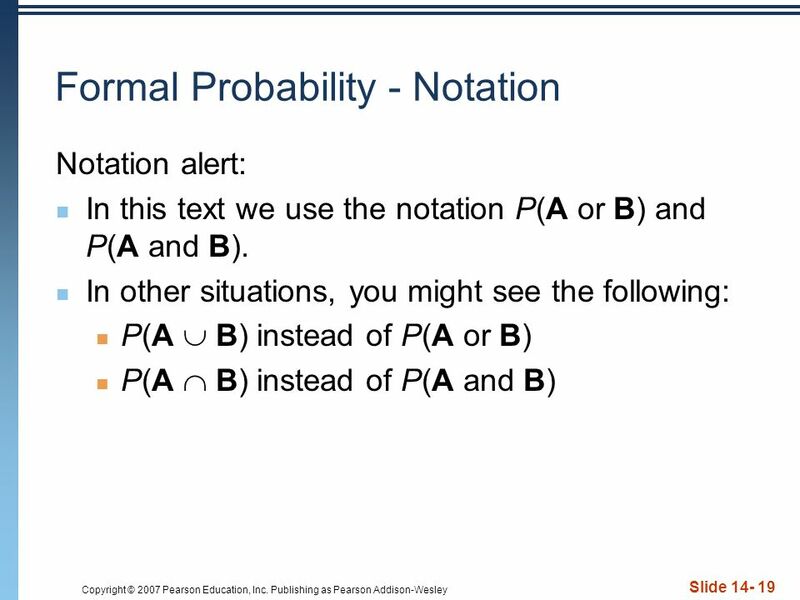 16 Copyright © 2007 Pearson Education, Inc. Publishing as Pearson Addison-Wesley Slide 14- 16 Formal Probability (cont.) 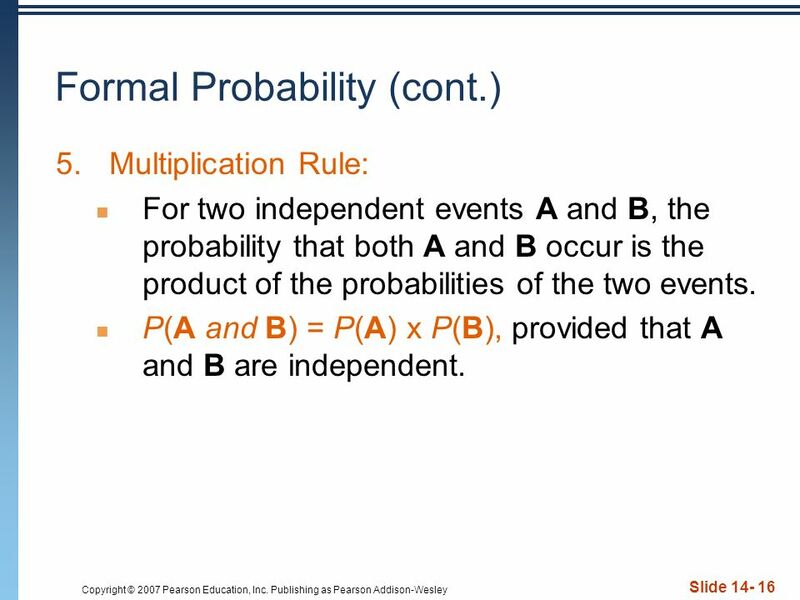 5.Multiplication Rule: For two independent events A and B, the probability that both A and B occur is the product of the probabilities of the two events. P(A and B) = P(A) x P(B), provided that A and B are independent. 18 Copyright © 2007 Pearson Education, Inc. Publishing as Pearson Addison-Wesley Slide 14- 18 Formal Probability (cont.) 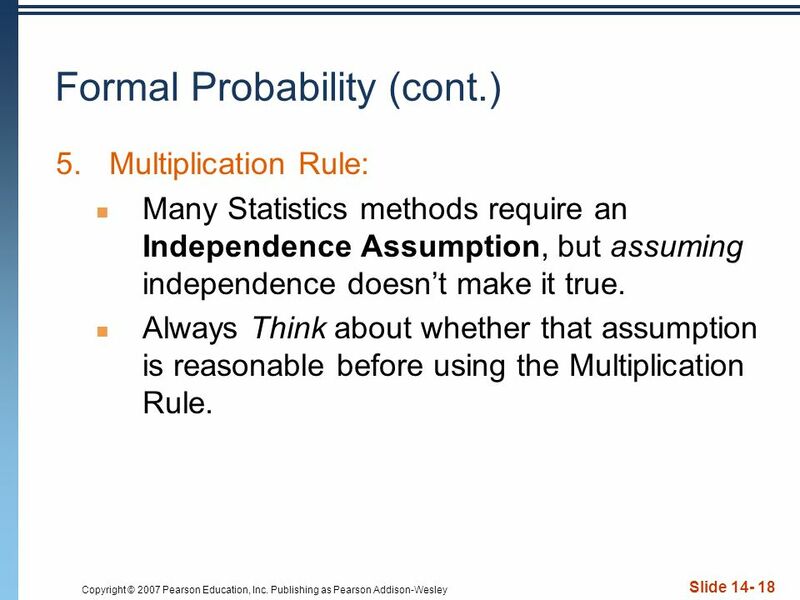 5.Multiplication Rule: Many Statistics methods require an Independence Assumption, but assuming independence doesnt make it true. Always Think about whether that assumption is reasonable before using the Multiplication Rule. 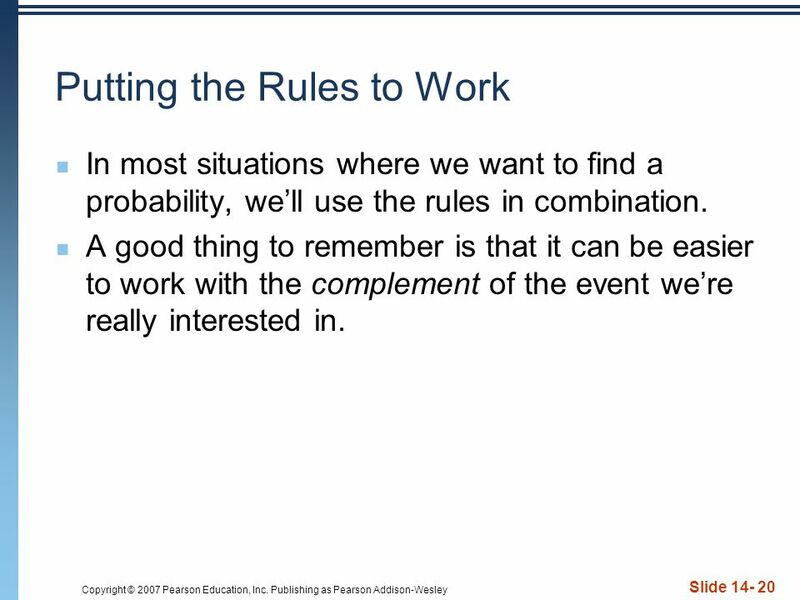 20 Copyright © 2007 Pearson Education, Inc. Publishing as Pearson Addison-Wesley Slide 14- 20 Putting the Rules to Work In most situations where we want to find a probability, well use the rules in combination. A good thing to remember is that it can be easier to work with the complement of the event were really interested in. 21 Copyright © 2007 Pearson Education, Inc. Publishing as Pearson Addison-Wesley Slide 14- 21 What Can Go Wrong? 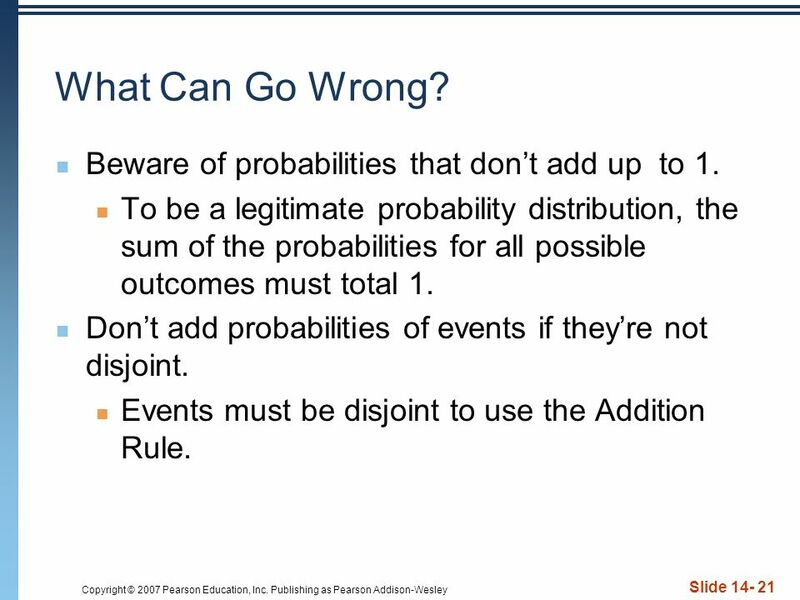 Beware of probabilities that dont add up to 1. To be a legitimate probability distribution, the sum of the probabilities for all possible outcomes must total 1. 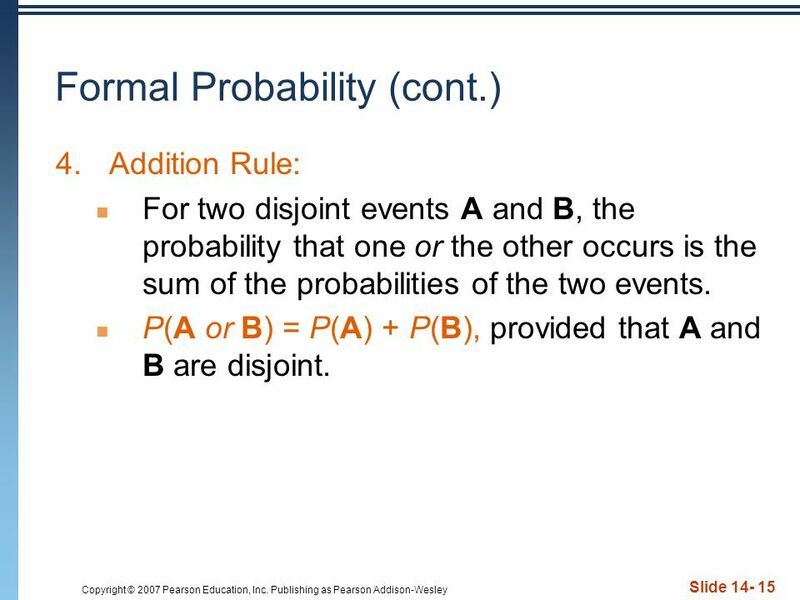 Dont add probabilities of events if theyre not disjoint. Events must be disjoint to use the Addition Rule. 22 Copyright © 2007 Pearson Education, Inc. Publishing as Pearson Addison-Wesley Slide 14- 22 What Can Go Wrong? (cont.) 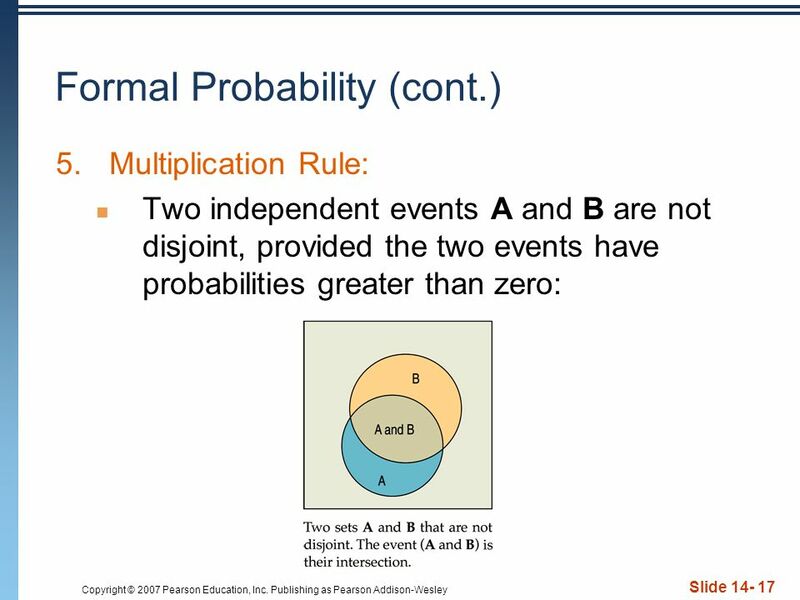 Dont multiply probabilities of events if theyre not independent. 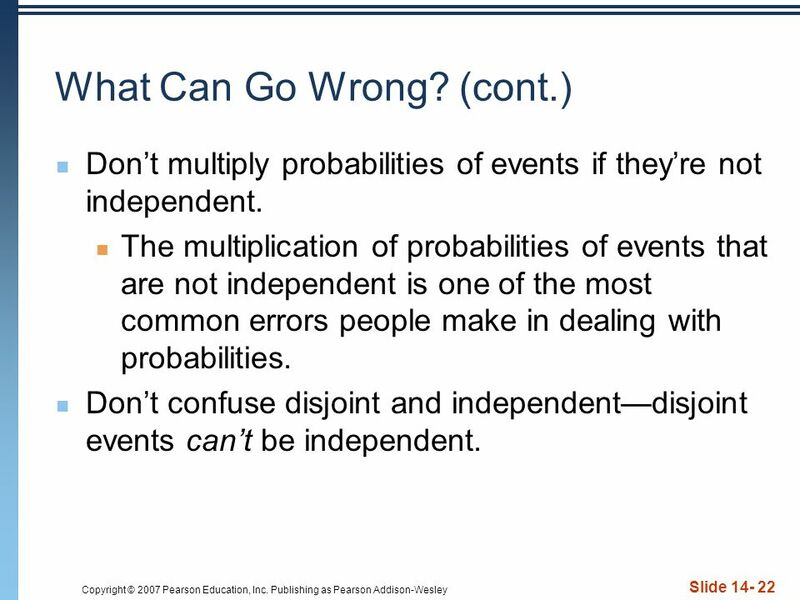 The multiplication of probabilities of events that are not independent is one of the most common errors people make in dealing with probabilities. Dont confuse disjoint and independentdisjoint events cant be independent. 23 Copyright © 2007 Pearson Education, Inc. Publishing as Pearson Addison-Wesley Slide 14- 23 What have we learned? 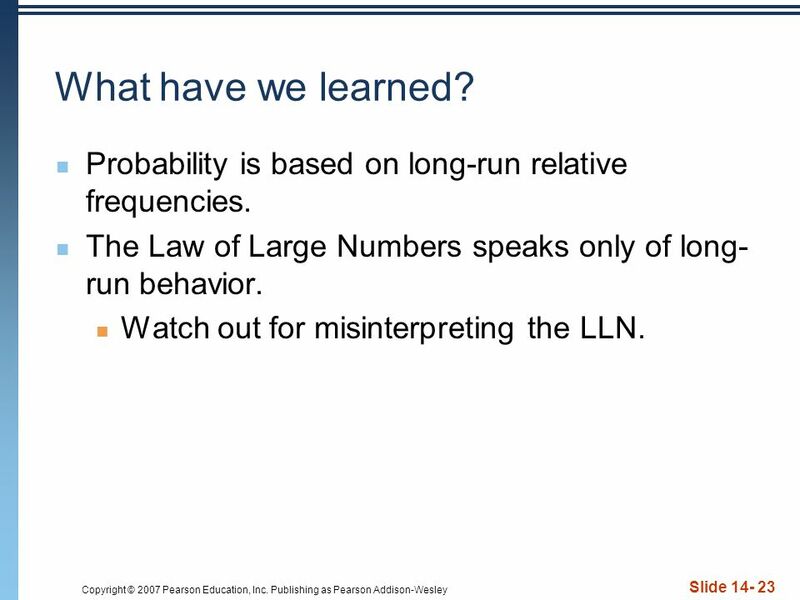 Probability is based on long-run relative frequencies. The Law of Large Numbers speaks only of long- run behavior. Watch out for misinterpreting the LLN. Download ppt "Copyright © 2007 Pearson Education, Inc. Publishing as Pearson Addison-Wesley Slide 14- 1." Copyright © 2007 Pearson Education, Inc. Publishing as Pearson Addison-Wesley Chapter 22 Comparing Two Proportions. Chapter 5 Test Review Sections 5-1 through 5-4. Warm Up Express the indicated degree of likelihood as a probability value: “There is a 40% chance of rain tomorrow.” A bag contains 6 red marbles, 3 blue. 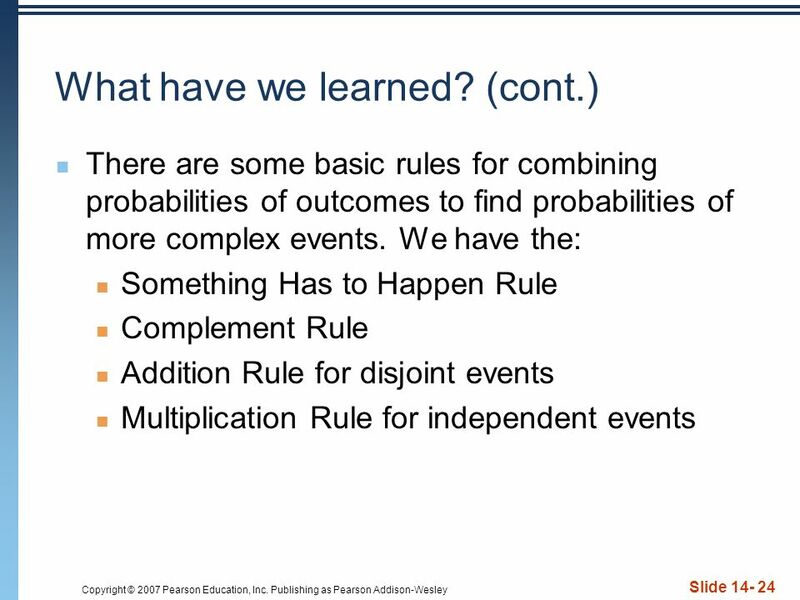 Copyright © 2010, 2007, 2004 Pearson Education, Inc. Chapter 15 Probability Rules! 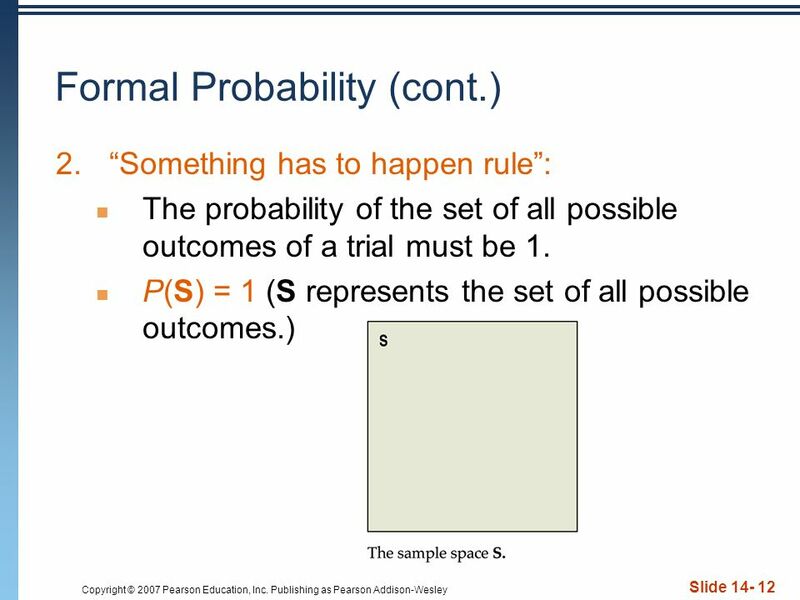 Copyright © 2010 Pearson Education, Inc. Chapter 15 Probability Rules! Special Topics. Definitions Random (not haphazard): A phenomenon or trial is said to be random if individual outcomes are uncertain but the long-term.